Pteridophytes are the plants of the great evolutionary values; they have the great empire in the middles of the carboniferous era. The Devonian and the Permian were the time when these plants dominated as the great and large ecosystem of the whole of the earth. This was the era when evolution of the all the other vascular plants was the major steps in the plant biology. In this series here we are Presenting some of the aspects of the review entitled as the Psilophytales cladistces lines of the evolution, these were considered as the early land plants with initial kinds of the vascular system, however after their original discovery in the 1920 by the kidston and the lang, these group of the plants has the tremendous change in the position and phylogeny of the many genera’s. The group has the very important phylogenetic values and major steps in the evolution of the early land plants. 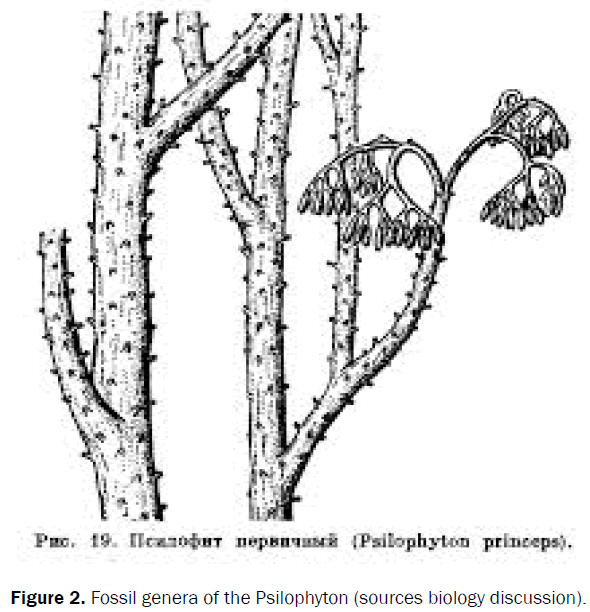 Psilophytales is the order which is the only and the unique order of the class psiliphytopsioda of the fossil pteridophytes. This class was the assemblage of the many kinds of the fossil flora of the many kinds of the morphological and the anatomical kinds of the similarities. Now many of the genera’s have been places in the different position after their proper analysis by the different kinds of the worker from time to time [1-5]. After new and the recent finding it was found that the psilophytales was the unnatural assemblage of them any kinds of the dissimilar genera’s [3-5]. The class psilophytopsida was established the 1920 by the kidston and the lang on the basis of the finding of the a long and the evolutionary conserved chart in the Scotland. The name of the class was established as the psilophyta by the assemblage of the three genera of the evolutionary values, these genera were, Rhynia, Horneophyton Psilolophyton [1-5]. They lack the true leaves and the roots; however, sporangia of the deformed structure have been reported in this chert [1,2,4,5]. However, by the recent classification, genera of the the psilophytales have been placed in the other classes which were formed by the [1-5]. In 1917 thess plants were the major findings of the kidston and the lang in the Rhynia chert bed of the Scotland. Rhynia chert is the early sedimentation deposits, which have the extraordinary assemblage of the many kinds of the fossils. The fossils have the great kinds of the conservation pattern. The morphological and the anatomical conservation was the so perfect that they elucidate the whole of the evolution in the Devonian era. This site was exposed in the Rhynia chert bed of the arbendeshire of the Scotland (Figures 1 and 2) [1,3,4,5]. Figure 1: Fossil psilopytales (sources kidston and Lang). Figure 2: Fossil genera of the Psilophyton (sources biology discussion). The second site which was the heaven of the fossil genera was the windyfiled chert of the Scotland. This site was situated in the 800 meters area of the abendenshire of the Scotland [2-5]. The Rhynia chert is the assemblage of the many kinds of fossil genera’s and the arthropods, other crustaceians [1-3,5]. 1) The pattern of the fossilization. 2) The ultimate ultra-structure details and the conservation of the fossils. The individual specimen was so well preserved that it opens the new era of the discovery of the many kinds of the genera of that era. The chert has been worked by the many workers from time to time. Initially it was discovered in the 1920 by the kidston and the lang, later the Rhynia chert was the subject of the study of the many workers one them was the Lyon 1934, after that in 1963 it was worked by the Bank et al in detail [1-5]. In 1980 the chert was again worked by the peoples of the university of the muenster, in 1987 by the abenden community. It is supposed that early silica rich water has petrified the whole of the giant ecosystem. Rhynia chert was the best fossil examples of the interaction of the earlyorganisms and the environment in the early Devonian period [2-5]. In 1920 by the work of the great palaeobatanist the class was named as the psilophytopsida and one of the order that has been placed in is the psilophytales [1-5]. In this order overall three genera’s have been placed, these genera’s have been summarised as the. These three genera’s have the following characters, these enlisted as lack of the true roots, true stem and the other features, however early remnants of the vascular bundles have been reported over there [1,4,5]. However, spornae in 1965 divided the class psilophytopsida in to the four families. these are enlisted as. On the basis of the findings of the new technologies it has become clear that the early constriction of the Rhyniopsida was the unnatural assemblage of the many kinds of the unrelated genera’s [2-4]. The molecular phylogeny demonstrates that these lines of the evolution shows the diversification of the life in different cladsitces. Bank et al., 1965 divided the whole of the class in to the three subdivisions, these are enlisted as. On the basis of the molecular phylogney crane et al., 2004 it is cleared that psilophytales liens of the evolution was polyphyletic in nature, previously monophylietic nature was deleted which was considered by the early palaeobotanist. Overall the psilophytales are the very important cladistices lines of the evolution. They have opened the door of the analysis of the lines of the evolution of the early land plants, since before discovery of these plants the evolution of the land plants was in dilemma and speculative, these cherts were the clear evidences of the great ecosystem of the plants. Crane PR, et al. "Fossils and plant phylogeny", American Journal of Botany. 2004;91:1683–99. Kenrick Paul and Crane Peter R. The Origin and Early Diversification of Land Plants. A Cladistic Study, Washington D.C. Smithsonian Institution Press.1997;249:139–40. Kidston R and Lang WH. "On Old Red Sandstone plants showing structure, from the RhynieChert Bed, Aberdeenshire. Part I. RhyniaGwynneVaughani", Transactions of the Royal Society of Edinburgh. 1917;51:761-84. Sporne KR. The Morphology of Pteridophytes London.1966.